Sigma may only have a couple of lenses designed exclusively for mirrorless cameras in its optics range, but if the 19mm f/2.8 EX DN is a sign of things to come we should feel very encouraged. Technical testing produced an outstanding set of MTF curves, that only dipped at the very smallest apertures, which is expected from any lens. With three aspherical elements in its construction the only chromatic aberration that could be spotted were traces in technical targets, with none in real-world images, and at just £150 the lens is a bargain too, with its effective focal length making it ideally suited for reportage and general street photography. In fact, its only real downside it that more people can’t take advantage of all this, as the lens is only currently available for the Micro Four Thirds and Sony NEX platform. 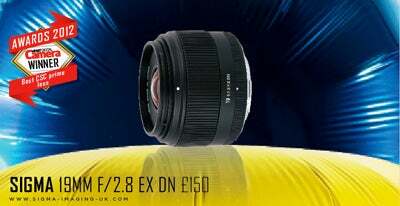 Sigma’s only other CSC lens to date, the 30mm f/2.8 EX DN, also impressed us greatly.